Which is the true day of rest, the Sabbath – Saturday or Sunday? Christian churches often discuss about which is the true day of rest, the Sabbath. Most churches and Christian associations keep Sunday. Only a small handful of people observe the Sabbath on Saturday. How is it possible that only a few people in the world keep Saturday and claim that they are right? Is there, somewhere in the Bible written that Sunday is the day of rest? I would like to share with you, what the Bible says regarding these questions. In order to find the correct answer, we have to start at the beginning of this world’s history. So, how did it all begin? God created the world by His Word in six days; and He rested on the seventh day. He blessed the seventh day and sanctified it, because that in it He had rested from all His work. The day of rest, set apart by God in the beginning, is the evidence of creation of this world. Genesis 2:1-3 - Thus the heavens and the earth were finished, and all the host of them. And on the seventh day God ended his work which he had made; and he rested on the seventh day from all his work which he had made. And God blessed the seventh day, and sanctified it: because that in it he had rested from all his work which God created and made. On the first pages of the Bible we can read about the beginning of this world’s history. There, the Bible tells us what day we should dedicate to our Creator. Let’s make a small step further through the Old Testament up to the Mount Sinai, where Moses received the Ten Commandments of God. There, he was given the true Ten Commandments, not those that the most Christians know from Catechism. Exodus 20:8-11 - Remember the sabbath day, to keep it holy. Six days shalt thou labour, and do all thy work: But the seventh day is the sabbath of the LORD thy God: in it thou shalt not do any work, thou, nor thy son, nor thy daughter, thy manservant, nor thy maidservant, nor thy cattle, nor thy stranger that is within thy gates: For in six days the LORD made heaven and earth, the sea, and all that in them is, and rested the seventh day: wherefore the LORD blessed the sabbath day, and hallowed it. Notice that God blessed the Sabbath day. In His commandments, God emphasized, the day of rest to such an extent that he made it holy! Consider the following verses, where the Lord highlights compliance with the Sabbath. He tells us that the Sabbath was to be observed as the evidence of creation of the world! Exodus 31:12-17 - And the LORD spake unto Moses, saying, Speak thou also unto the children of Israel, saying, Verily my sabbaths ye shall keep: for it is a sign between me and you throughout your generations; that ye may know that I am the LORD that doth sanctify you. Ye shall keep the sabbath therefore; for it is holy unto you: every one that defileth it shall surely be put to death: for whosoever doeth any work therein, that soul shall be cut off from among his people. Six days may work be done; but in the seventh is the sabbath of rest, holy to the LORD: whosoever doeth any work in the sabbath day, he shall surely be put to death. Wherefore the children of Israel shall keep the sabbath, to observe the sabbath throughout their generations, for a perpetual covenant. It is a sign between me and the children of Israel for ever: for in six days the LORD made heaven and earth, and on the seventh day he rested, and was refreshed. Now, we leave the Old Testament and turn our attention to the New Testament, to the time of Jesus Christ. What day of rest did Jesus Christ observe, what did He say concerning the Law? Can it be changed or is it unchangeable? When we read the New Testament carefully, we can see that, when He lived on this earth, Jesus observed the seventh day Sabbath as the day of rest. Matthew 5:17-19 - Think not that I am come to destroy the law, or the prophets: I am not come to destroy, but to fulfil. For verily I say unto you, Till heaven and earth pass, one jot or one tittle shall in no wise pass from the law, till all be fulfilled. Whosoever therefore shall break one of these least commandments, and shall teach men so, he shall be called the least in the kingdom of heaven: but whosoever shall do and teach them, the same shall be called great in the kingdom of heaven. As we have seen, Jesus during his life kept the Sabbath. Now, we have learned that He clearly pointed to the everlasting validity of the Law. Let’s have a look at the disciples. What did they do after the death and the resurrection of Jesus? Did they keep the seventh day Sabbath or the first day of the week – Sunday? The disciples kept Sabbath. Again, we can find evidence in the Bible, if we read it carefully. Acts 13:42-44 - And when the Jews were gone out of the synagogue, the Gentiles besought that these words might be preached to them the next sabbath. Now when the congregation was broken up, many of the Jews and religious proselytes followed Paul and Barnabas: who, speaking to them, persuaded them to continue in the grace of God. And the next sabbath day came almost the whole city together to hear the word of God. Acts 16:13 - And on the sabbath we went out of the city by a river side, where prayer was wont to be made; and we sat down, and spake unto the women which resorted thither. Acts 18:1-4 - After these things Paul departed from Athens, and came to Corinth; And found a certain Jew named Aquila, born in Pontus, lately come from Italy, with his wife Priscilla; (because that Claudius had commanded all Jews to depart from Rome:) and came unto them. And because he was of the same craft, he abode with them, and wrought: for by their occupation they were tentmakers. And he reasoned in the synagogue every sabbath, and persuaded the Jews and the Greeks. And now, let's see, what God tells us in the Bible, about the day that will be celebrated on the new earth. Just guess, will it be the seventh day Sabbath or the first day Sunday? Isaiah 66:22-23 - For as the new heavens and the new earth, which I will make, shall remain before me, saith the LORD, so shall your seed and your name remain. And it shall come to pass, that from one new moon to another, and from one sabbath to another, shall all flesh come to worship before me, saith the LORD. With the help of the Bible, we concluded that Jesus and his followers kept the seventh day Sabbath according to the God's commandments. So the Lord Jesus Christ left us an example to follow in his footstep. 1 John 2:4-7 - He that saith, I know him, and keepeth not his commandments, is a liar, and the truth is not in him. But whoso keepeth his word, in him verily is the love of God perfected: hereby know we that we are in him. He that saith he abideth in him ought himself also so to walk, even as he walked. Brethren, I write no new commandment unto you, but an old commandment which ye had from the beginning. The old commandment is the word which ye have heard from the beginning. And what about Sunday, where did it come from, who invented it and why? Many Christians claim that Sunday began to be celebrated after the resurrection of Jesus Christ by his disciples. They began to observe and celebrate it as evidence of the resurrection of the Lord Jesus Christ, on Sunday. However, as we have read in the Bible, the disciples kept the seventh day Sabbath of our Creator. Nowhere in the Bible, it writes anything about Sunday and about the transition of Sabbath from Saturday to Sunday. On the contrary, we have just explained, what Jesus said concerning the Law – the Law is still in force. Mark 2:27-28 - And he said unto them, The sabbath was made for man, and not man for the sabbath: 28 Therefore the Son of man is Lord also of the sabbath. Matthew 12:8 - For the Son of man is Lord even of the sabbath day. It is true, Jesus pronounced these words. However, it is necessary to understand them properly. Many argue that this is evidence of the great freedom, that we can use Sabbath at our discretion and abandon old forms. Therefore, we will explain these statements in order to make clear what Jesus wanted to tell us concerning the Sabbath. In the time of Jesus, priests and Pharisees had made the Law a wearisome burden. They invented statutes and ceremonies that were unimaginably hard to observe and twisted the Law of God. Matthew 12:1-5 - At that time Jesus went on the sabbath day through the corn; and his disciples were an hungred, and began to pluck the ears of corn, and to eat. But when the Pharisees saw it, they said unto him, Behold, thy disciples do that which is not lawful to do upon the sabbath day. But he said unto them, Have ye not read what David did, when he was an hungred, and they that were with him; How he entered into the house of God, and did eat the shewbread, which was not lawful for him to eat, neither for them which were with him, but only for the priests? Or have ye not read in the law, how that on the sabbath days the priests in the temple profane the sabbath, and are blameless? Jesus wanted to point out that Sabbath is the day of rest, day of contemplation and conversation with God, a day of joy when you remember God and your fellowmen. It does not mean that you torture yourself by practicing meaningless traditions created by man. Another favorite argument is that Sunday was observed already before, since ancient times. Yes, I agree. 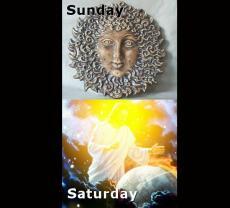 Pagans really observed Sunday in ancient times and it was consecrated to the sun-god, which was a form of idolatry. The first reference of keeping Sunday appeared in the church in Rome, where the majority of believers were pagans. At that time, in the capital of the empire, emerged strong anti Semitic tendencies. Therefore, Christians wanted to distinguish themselves from the Jews as much as possible. Often the two were confused especially because of the Sabbath – the same day of worship. This was the reason of the first attempt to observe another day, than the Jews did. In some places Christians tried to introduce a new day of worship, but the most Christians continued to observe the seventh day Sabbath throughout the whole empire, until the 5th century. After the big and severe persecution, Christianity experienced brighter times. It was officially recognized, and on March 7, A.D. 321, Emperor Constantine issued a decree transferring the day of worship from Sabbath to Sunday. Constantine was a pagan, devotee of the sun-god. Therefore, he ordered celebration of the day of sun. At the time, when the decree was enacted, Constantine was not a follower of Jesus Christ. He was baptized only on his deathbed. The reason of establishing Sunday as a day of worship was not commemoration of Christ’s resurrection but he did it rather to spite the Jews. The Church adopted the law of Constantine at the council of Laodicea in A.D. 364. In this way, the church enacted the first religious Sunday law. Canon 29 established that Christians were to celebrate Sunday, and if possible they should not work on that day. On the other hand, they should not be idle on Saturday, but shall work on that day. Let’s have a look on what the Catholic catechism of 1977 says. There we can find the following series of questions and answers: Q. Which is the Sabbath day? A. Saturday is the Sabbath day. Q. Why do we observe Sunday instead of Saturday? A. We observe Sunday instead of Saturday because the Catholic Church transferred the solemnity from Saturday to Sunday. Can a man really change the God's Law? Those of you, who have read this article till the end, remember that the only day of rest is Sabbath of our Creator. In the last days of this world’s history, Sabbath will be the pillar of the test of our faith. Everyone will have to decide upon which side of the controversy he will stand, whether on the side of the Lord, our Creator, who is love; or on the side of the dragon, that old serpent called the devil, or Satan. AmazingHope.net - The Day of Rest – Saturday or Sunday?